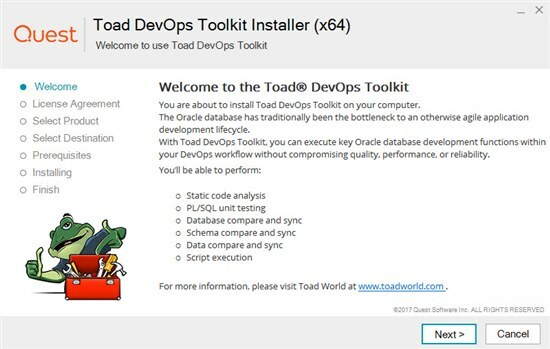 Before you read this article, please make sure you’re familiar with what Toad DevOps Toolkit is and the problems it solves in bringing your Oracle development/deployment operations into an automated process. 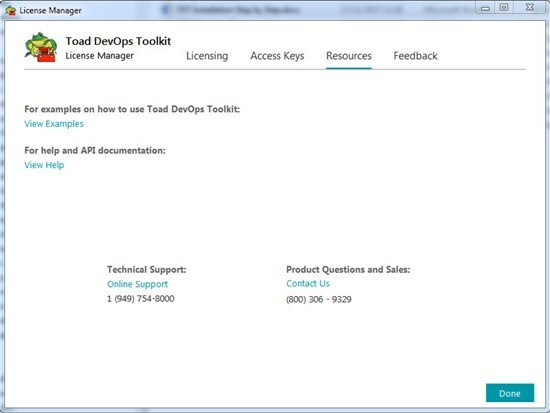 My previous blog post will introduce you to Toad DevOps Toolkit. Installing Toad products has always been a really simple process and Toad DevOps Toolkit is no exception, but since this is not a desktop GUI application, I thought I’d explain how to install and license this product so you get off to a good start. I’ve also created a couple of short videos (available shortly) which will run through the steps. 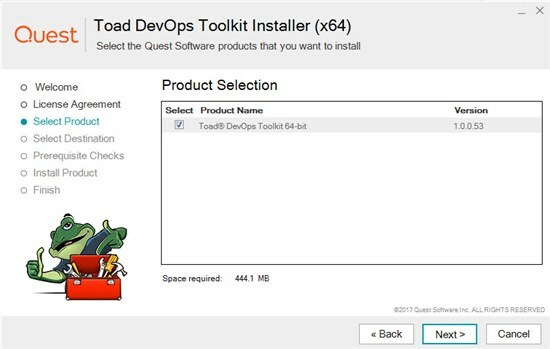 Toad DevOps Toolkit is available in both 32-bit and 64-bit forms. Both come with an embedded trial key which is valid for 30 days to enable you to evaluate it. Should you decide to purchase, you can use the same installed version in which to apply and activate a commercial license. No need to install a separate product. 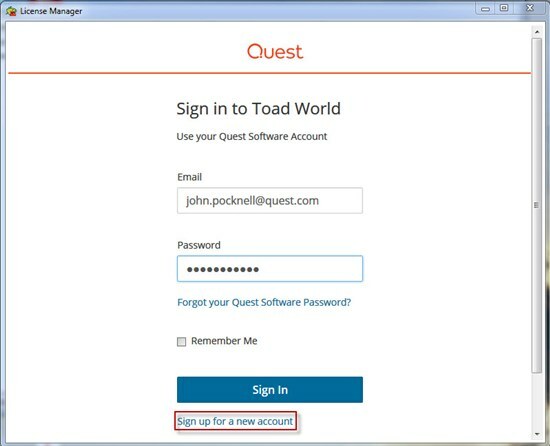 The trial versions are available from https://www.quest.com/products/toad-devops-toolkit/ as well as https://www.toadworld.com/products/toad-devops-toolkit/. Click the Next button to continue to the Licensing screen. Read the license agreement, check the acceptance box and click the Next Button to continue to the Product Selection screen. Please note that, unlike other Toad products, Toad DevOps Toolkit does not support “side-by-side” installations. If you have an older version of the product, this will need to be uninstalled first. The “Prerequisites checks” screen will detect and notify you if you already have an existing installation. Click the Next button to continue to the Destination Selection screen. 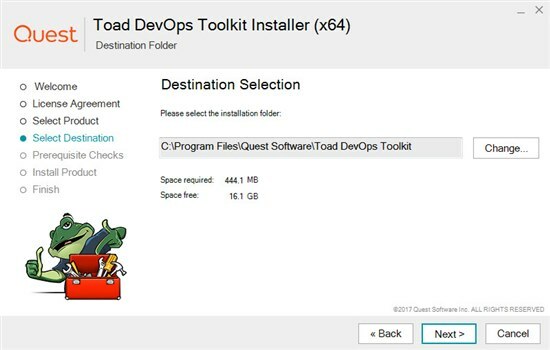 This shows the default installation folder where Toad DevOps Toolkit will be installed. You can change it if you wish. Click Next to continue to the Prerequisite checks screen. The purpose of this stage is to ensure your computer is in the right state to run Toad DevOps Toolkit. 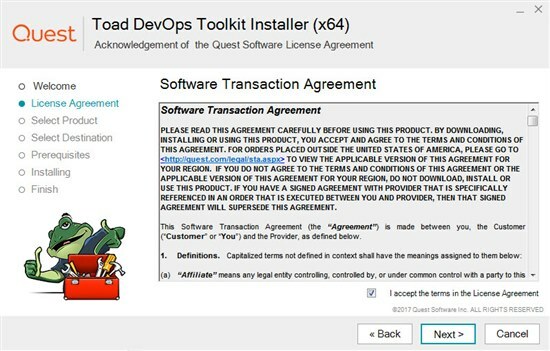 The first check is to see if you already have Toad DevOps Toolkit installed and, if so, which version. The next check is to ensure you have an appropriate Oracle client installed on the machine you are installing the product onto. The next check ensures you have sufficient disk space to install the product. The next check ensures you are running the installer as a Windows Administrator. And finally, we check that you have a compatible browser so that you can activate the license key, since this is carried out online. If you have any red “x”s against any items, correct the problem first, then click the “Check Again” button. If you want to go ahead and install then fix some of the items after installation, click the “Ignore All” button to continue. 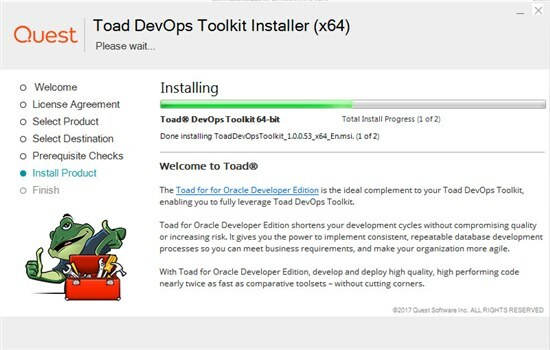 Once you are ready, click the “Install” button to install Toad DevOps Toolkit. The installer will proceed with your installation. 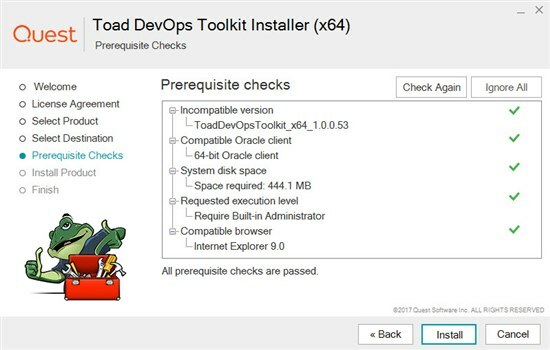 In the meantime, you can read about the Toad for Oracle Developer Edition which is what I would strongly recommend you use as a complementary desktop solution to Toad DevOps Toolkit in order that you realize the full value of Toad DevOps Toolkit. Toad Developer Edition includes Toad, Code Tester for Oracle for the creation and storing of PL/SQL unit tests (accessible by Toad DevOps Toolkit), Code Analysis for defining your coding standards templates (which can be accessed by Toad DevOps Toolkit) as well as Toad Data Modeler for physical and logical data modelling. Also included are SQL Optimizer for Oracle for automating the task of tuning SQL and PL/SQL code and Benchmark Factory for performance and scalability testing. The latest version of Benchmark Factory (v8.0) also enables you to automate performance testing via its REST API interface by calling tests from Windows PowerShell. For more information on this, have a read of this blog. You can also compare the modules and features offered by Toad for Oracle Developer Edition against other Toad Editions here. After installation has concluded, you can visit the new Toad DevOps Community page on Toad World. Leave the “Launch License Management Utility” checkbox checked on and click the “Finish” button in order to license the product. 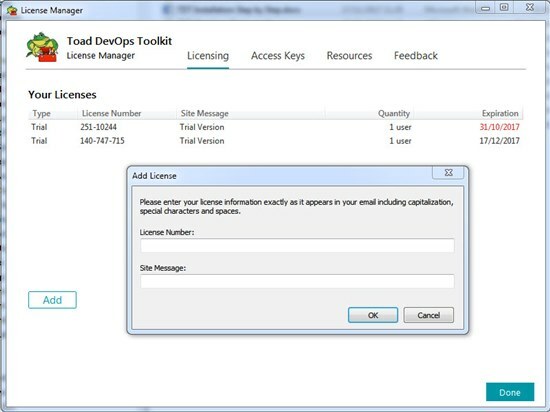 If you want to run the License Management Utility separately, you can do so by going to Start | All Programs | Quest Software | Toad DevOps Toolkit | License Manager. Make sure you launch this utility as Windows Administrator. The License Management Utility with enable you to activate either the 30 day trial key that comes with the product, add an extended trial license or activate a full commercial license. License activation requires that you have an active Toad World account. If you do not have one, you can click the “Sign up for a new account” hyperlink where you will be directed to the Toad World user community. If you already have an account, enter your email address and password and click “Sign In”. This utility has 4 tabs. The Licensing tab displays any license you currently have activated as well as any that have lapsed. 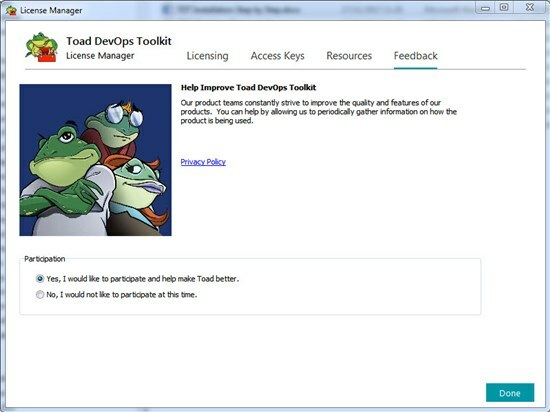 In the screenshot above, you can see the initial trial license that came with Toad DevOps Toolkit has expired. I requested an extension and after receiving an email with the new License Number, I was able to enter in this window using the “Add” button and inserting the License Number and Site Message into the appropriate fields. You would use the same process if you purchase the product. You will next need to create an Access Key which is like a token which Toad DevOps Toolkit uses to validate a license without requiring internet access and which will be unique to you. This is stored on your Windows machine. Access keys are secret and is tied to your personal Toad World account. Distributing Access Keys to others may result in a violation of your Software License Agreement. To create an Access Key, click the “Add” button, enter a unique name for the key and click OK. 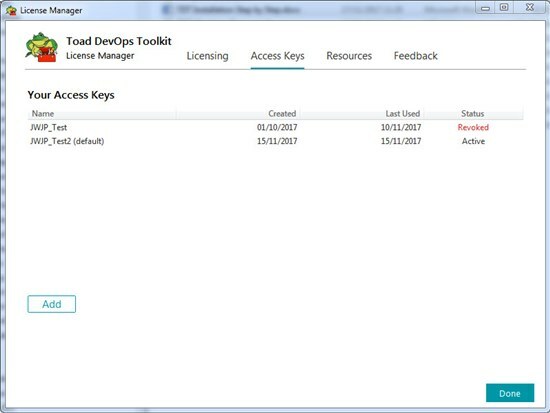 The License Manager application will automatically add the Access Key to your Toad World account and install it locally for use by TDT on the current machine. To revoke an access key, simply highlight the Access Key and click the Revoke button. You can see in the screenshot above that I have one active Access Key and one that is revoked. The “Resources” tab of License Manager gives you quick access to local and online resources that will help you get started with TDT as well as contact information for both support and sales. The final “Feedback” tab of License Manager allows you to choose whether or not to participate in our Toad DevOps Toolkit improvement program. 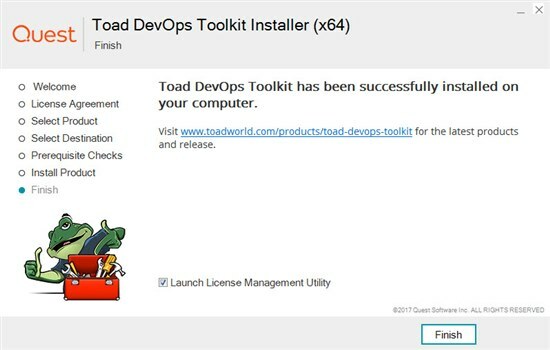 Click the “Done” button and now you are ready to start using Toad DevOps Toolkit! Please be sure to participate in the new Toad DevOps Toolkit Toad World community which has blog articles, user forum, Idea Pond so you can suggest new ideas for features or enhancements for future versions of the product as well as Quick Links to downloads, product videos and other information about Toad DevOps Toolkit. For more information on Toad DevOps Toolkit, please read the new White Paper on the challenges of bringing database processes into DevOps and the new Technical Brief which explains what Toad DevOps Toolkit does. 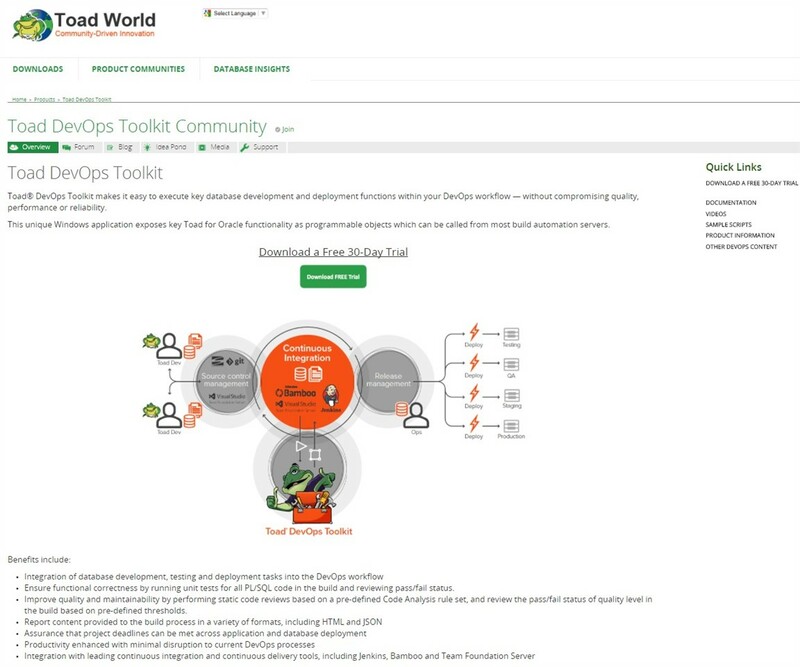 Enjoy using Toad DevOps Toolkit and please tell us what you think in the Toad World user forum. Oh, and look out for Part 2 of this blog series where I talk about invoking Toad DevOps Toolkit using Windows PowerShell scripts.